I wake up ravenous every single morning. My growling stomach at 6 am is way more reliable than any alarm clock my money can buy. The second I'm out of the shower in the morning, I'm in the kitchen scavenging for food. I'm definitely a creature of habit when it comes to my weekday breakfasts. 90% of the time I eat oatmeal, an egg and cheese sandwich, or Greek yogurt with granola. This is usually my granola of choice, but as you may have gathered given that I write a blog about cooking, I prefer to make things homemade whenever possible. 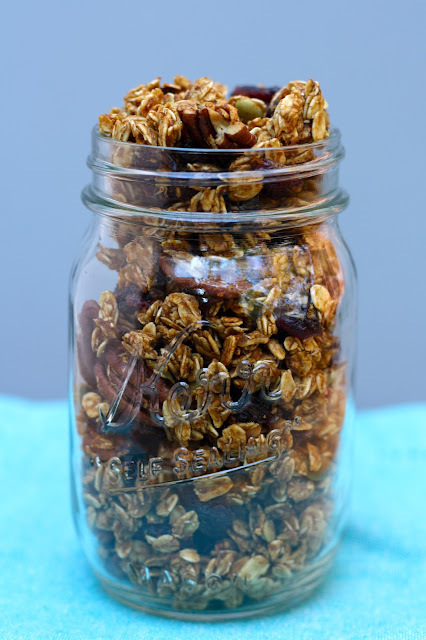 When I came across this pumpkin granola on Kristin's gorgeous blog earlier this fall, I immediately knew it would make it onto my fall cooking list. It was so simple to make that I think it's going to replace my normal store-bought brand of granola, unless a bout of extreme laziness hits. This makes an enormous batch - a little over 6 cups. I tend to use granola as more of a garnish - a small scoop on top of yogurt for some crunch, rather than eating it mixed with milk like cereal, so this should last me quite awhile! This granola is totally customizable. Prefer walnuts to pecans? Throw 'em in. Dried apricots instead of raisins? Chop some up and toss them in too. This granola has a light pumpkin flavor, and a lot of fall spice. Make sure to let it cool completely before storing it, so that it doesn't get soggy! Added bonus? Your house will smell like you have about 50 pumpkin candles burning at once since this is so deliciously fragrant! In a large bowl, stir together pumpkin puree, cinnamon, nutmeg, ginger, and salt. Stir in brown sugar, maple syrup, and vanilla until thoroughly combined. Add the oats, cranberries, raisins, pecans, coconut, and pumpkin seeds to the bowl. Stir to evenly coat with the pumpkin mixture. Spread evenly on the prepared baking sheet. Bake in the preheated oven for 35-40 minutes, stirring well at the 20 minute mark. It will not be crisp when you remove it from the oven, but it will crisp up as it cools. Allow granola to cool for several hours before storing. I've never really been a granola fan, but I think that this is next on my list to make. This sounds absolutely incredible! Such a great idea! 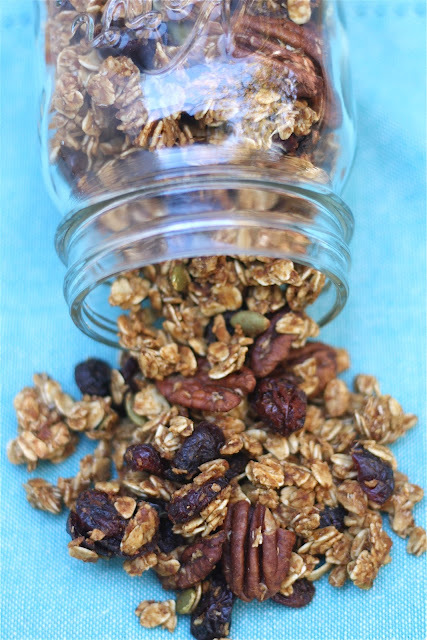 We love making homemade granola - this version is perfect for Fall!